Every coffee brewer needs a filter to produce coffee. Unless you have a single-serve brewer and opt for pre-packaged pods, you will need to purchase coffee filters to prevent grounds from getting into your cup. 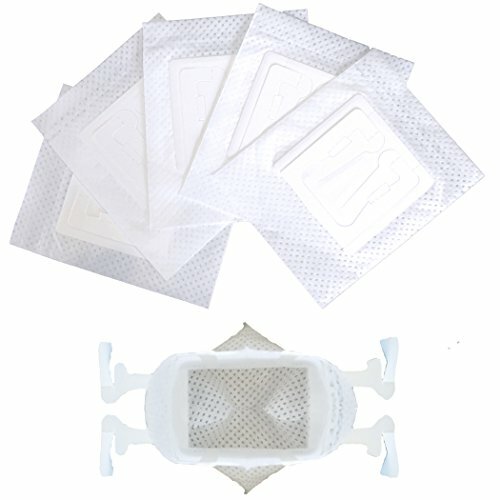 If you want something other than a disposable filter, you can purchase reusable filters. These are manufactured with a combination of materials, including steel mesh for the coffee to flow through, or a new “gold coffee filter” for various Keurig models. Hemp filters are also available on the market, but may not be for everybody. There is a confusing array of coffee filter sizes, brands and materials from which to choose. We have looked at some of the best coffee filters, made with a variety of materials, to help guide your selection. Melitta brands itself as the number one coffee filter maker in the world, so you should expect quality. The #4 cone filters are for 8 to 12-cup electric cone drip coffee makers. Be sure your brewer needs a #4 cone filter. 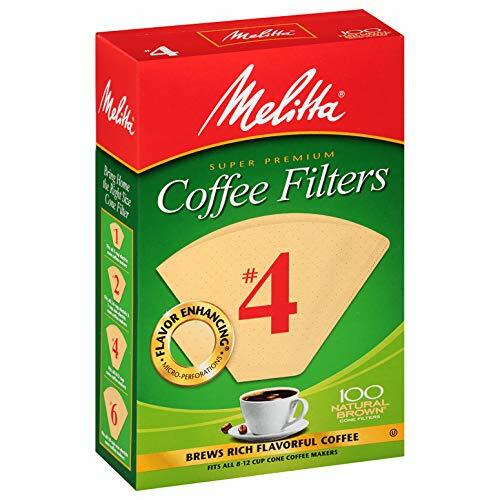 Their filters are a natural brown and feature patented “flavor enhancing micro perforations.” According to Melitta, this creates maximum flavor coming through the filter. 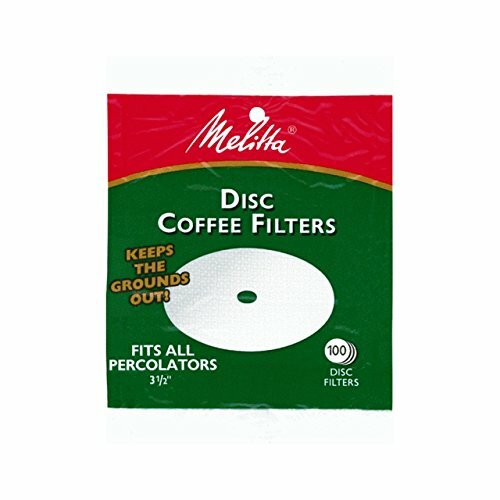 Melitta filters also have new, unique measuring markings. Each marking on the filter is equal to two tablespoons, so you can add your coffee without needing to use a measuring scoop. They also have a double crimped seal that keeps the filter from bursting at the bottom. These filters are for use with brewers that have baskets and a capacity of 8 to 12 cups, such as Hamilton Beach, Mr. Coffee. According to Rockline, they provide superior coffee filtration because they are made from firm, crepe-textured paper. This white (therefore bleached) paper absorbs oils and will eliminate gritty sediment in your coffee. Despite looking like a thin filter, these do stand straight up in the basket when wet. This makes them sturdy and prevents grounds from leaking over a slumped filter. Designed specifically for coffee percolators, these filters should fit all models and lay flat on the bottom of the percolator basket. Made from chlorine-free paper, they are supposed to reduce the oil and sediment that can seep into coffee. Some people use a percolator without filters, but these add that extra level of filtering. It’s even possible to rinse and re-use percolator filters. Even with a single-serve machine, there’s the option of getting filters. Keurig makes these reusable filters for the 2.0, K200, K300, K400 and K500 series of brewers. These are ideal if you want to use your own coffee rather than purchase pods. They are better for the environment and easier on your wallet than disposable pods. These filters are for single cups and will also brew for all carafe sizes, including 2-3 cups, 3-4 cups and 4-5 cups. 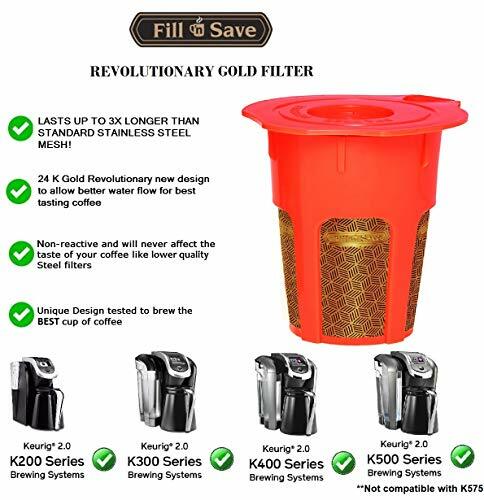 With a “24 Karat gold” design that Keurig claims lasts three times longer than regular stainless steel mesh pods, they allow for better coffee flow with no effect on the taste. This design also has a silicone “O” ring for additional sturdiness and to prevent leakage of grounds or residue. They’re BPA free and dishwasher safe. In another coffee guide we covered the question, “Can you reuse k-cups“? Yes, but not very well and these reusable K-cups are a better option. 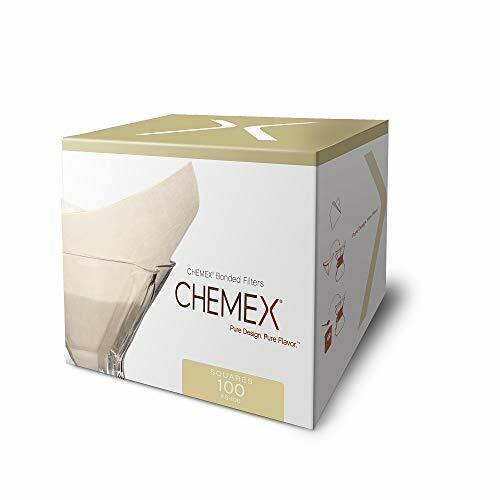 These filters are designed for conical filter brewers, including the Chemex brand of “pour-over” coffee makers, although there is one model which is incompatible. They are available in either white or brown, so with bleached or unbleached paper. The paper quality catches fine particles and sediment to keep them from escaping into your brew. Available in different shapes, including a square shape that is pre-folded for use, the square ones do have some minor differences compared to the circular, cone-shaped filters. For one, the square end sticks out of the coffee maker, making it easier than the round fitted filters to grab and lift out. The folding also makes the filter a little thicker against the spout where the coffee pours out. 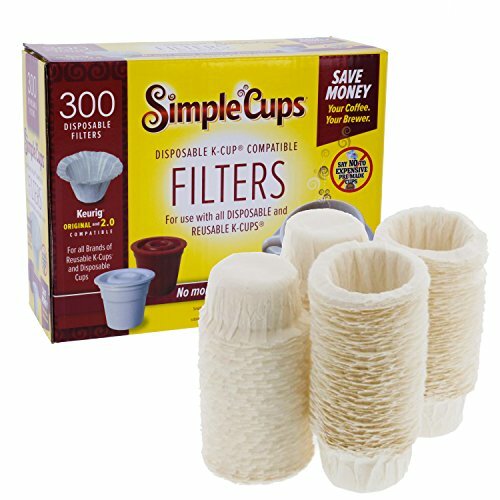 These filters are ideal for the environmentally conscious coffee drinker, but also suited to the discerning connoisseur. 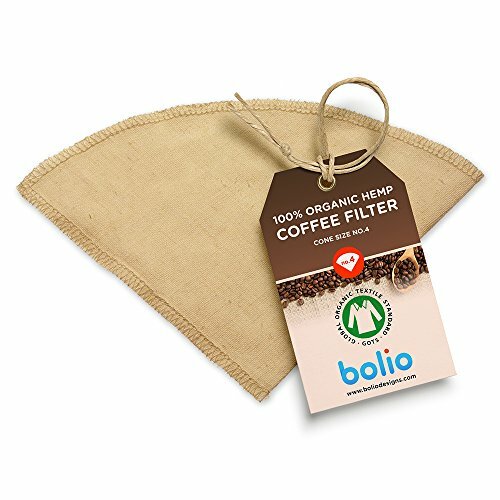 Bolio’s 100% organic hemp cone filter is durable and designed to be used over and over, a benefit over disposable filters. Hemp filters out sediment while allowing coffee oils to be retained, producing a more flavorful cup of coffee. These are #4 cone filters and are specifically designed for pour-over coffee makers. Hemp is stronger than cotton, and is also naturally mildew and bacteria resistant. It’s easy to clean and re-use. To clean the filter, rinse with hot water after each use and hang to dry. 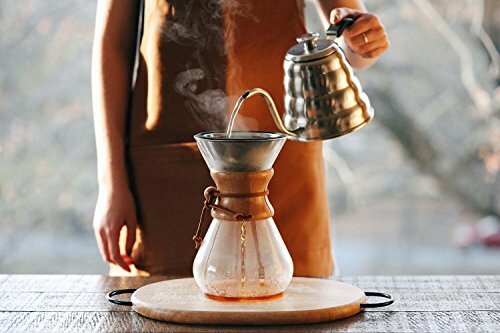 This reusable filter is for pour-over coffee makers and is designed to fit Chemex and Hario brand makers, but can be used with most coffee drippers. Made from titanium-coated stainless steel, which produces the gold color, its design has dual filtration, featuring a combination of stainless steel mesh and a laser-cut filter. Claiming to allow more natural oils and nutrients to flow into the pot than with a paper filter, it is also more environmentally friendly and cost-efficient over time than paper filters. Although it is dishwasher safe, the cleaning instructions recommend dumping the coffee grounds and rinsing the filter under warm running water after each use. It’s also recommended that you de-scale it every two to three weeks in a solution of vinegar and water. This is a truly portable coffee “maker.” These little filter systems fit into a cup and allow you to pour water over coffee and through the filter to make a cup wherever you are making them truly portable. All you need is coffee and hot water. These claim to be high-quality and ultra-fine fibers that provide a pure coffee flavor. The filters have small tabs on the sides that hook over your coffee mug. Scoop a spoon or two of coffee into the filter, depending on the strength you prefer, then slowly pour hot water until the grounds are wet. Wait 30 seconds then continue pouring water until you have enough. Carefully remove the paper filter, discard, and enjoy your coffee. 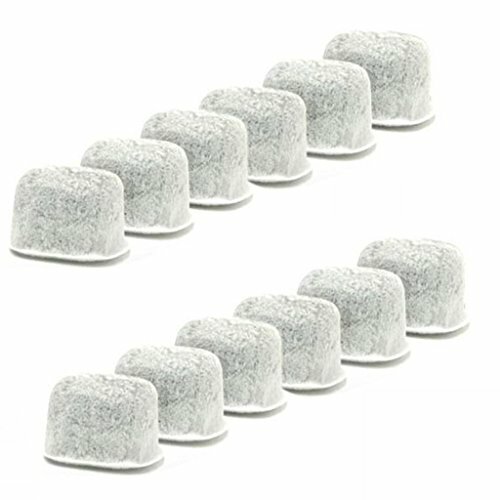 For those who don’t like purchasing individual, disposable K-cups, these filters are another option to make reusable pods. They can turn disposables into reusable, and help reduce the sediment and other particles that can sometimes flow through a reusable pod. These small filters fit into reusable pods and can also be placed in a disposable pod after it’s been used once, allowing you to re-use a purchased pod. They can be used in all brands of reusable K-cups and disposable K-cups. You can also purchase Simple Cup disposable cups to use with them. Despite all your efforts at choosing the right filters, along with the coffee you love, if your water is lousy, there’s a good chance your coffee will be too. These water purification filters will help ensure you get good tasting, healthy water in your Keurig system. These filters purify the water and absorb and eliminate chlorine, sediment, other compounds, taste, and odor from water. Specifically designed for all Keurig brand coffeemakers that require water filters, they fit all Keurig machines manufactured after 2007. To use, soak the filter in water for 10 to 15 minutes. Rinse the filter cartridge under running water for 60 seconds, place the filter cartridge into the holder, and install the holder into your Keurig coffee machine. It’s recommended that they be changed every 60 days or 60 tank refills.